For an angler, it is imperative that you load a new line from time to time. While at it, the correct loading is of supreme importance if you want to avoid a line twisting nightmare when fishing. Naturally, the line should hang limp and should be free of any coils and tangles when you cast. Loading this line is something you can do yourself but I can tell you that it’s not an easy task. I used to dread it for some time. But after my fishing buddies took me through the right way on how to put a line on a spinning reel, I soon overcame my fears. Today, I am going to share with you the tips I was given, and still, use up to now. In the end, you should be confident enough to try it out yourself. First of all, a trouble-free process starts by ensuring you have all the right tools for the job. Ensure your reel is in top shape, and that you have chosen the right line to go with it. Among all of these, I find choosing the line to be a most critical part. Let me start by highlighting how it’s done. On several occasions, I have witnessed anglers miss a catch because they used a weak/inappropriate line on the fishing rod. In the early days, I used to be a victim too until I learned that all spinning reels have their complementary lines. 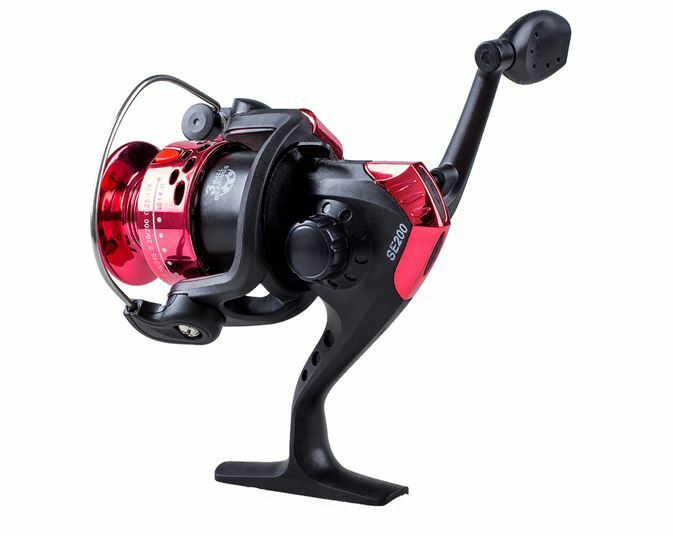 Whether it’s a mono, braided or a fluorocarbon line, it has to match the unique design and capacity of every spinning reel. If you look carefully on your notice, you will notice some numbers written on it. It is these that should guide you on which line to choose. For instance, one of my reels reads 12/120. This notation means that I can only rig a line of 12 pounds tests (usually about 120 yards). However, these will differ from reel to reel. Following these specs is what enables me to achieve the maneuverability I desire at the end. The maximum load and weight the reel can hold should guide your choice of line. For better results, I would suggest that the line should be slightly shorter than the maximum length mentioned. Often forgotten is the bail which is the latch that secures your spinning reel onto the fishing rod. I have this latch opened so that it does not hinder the spooling process of the reel. To open it, I swing it up and then back to secure it when I am done. When the bail is opened, you can then easily access both the drag and the reel. Ultimately, there is a better chance of doing a great spooling job with the line not hanging loosely or tangling when casting into the water. For this step, I hold the empty reel just in the same way it is naturally oriented to the fishing rod when in use. Then, turn the reel handle as you would do when retrieving and note the direction in which the bail turns. This direction is essential as it represents how the new line spools onto the empty reel. The other direction represents how the line spools off the reel when casting the line to fish. Another direction of rotation you would want to be sure of is that of the new line itself. You would want to ensure that the direction of line spooling off matches that of the bail rotation during retrieval. I usually do this by setting the new spool on the ground with the label facing up. Next, I place the spinning over the new line and reel it slowly, just like I did before. You can then proceed by grabbing a new line and pull to see the direction it spools in. These two directions should be the same but if they are not, flip the spool over. The new direction should automatically match that of the spinning reel. After determining the right directions, attach one end of the line to the reel spool by the use of an arbor knot. Some anglers use a different procedure whereby the reel is mounted onto the rod and threaded through the guides before being attached to the fishing rod. Regardless of the method you choose, first tie one end of the line on the spool using an arbor or overhand knot. Then wrap the line around the spool once and then tie another knot. To ensure I don’t worry about line tangles, I normally make sure that the first knot stays on the loop’s outer parts. If this proves too hard, you can use an adhesive to secure the knot in place before you begin reeling. This process starts by slowly turning the crank handle using your cranking hand. To prevent the line from wounding loosely or tangling as it wraps onto the spool, use your thumb and index finger of your casting hand to hold the line. Be careful with the speed. I once turned the handle too fast and the line almost cut my fingers holding it out. This step can be done by one person, but if you can get an assistant then that would be better. He/she can thread a dowel through the new spool and hold it parallel to the reel spool. The other person can also apply additional pressure to the line to supply extra tension on the line. The line wound should not go beyond the spool edges. Keep a clearance of about 1/8 or 1/6 inches from the rim of the spool. Pro Tip: Unscrewing the spool once reeling is done and dipping it in warm water for about 10 minutes makes it lose its memory. A freshly spun line developing twists and tangles should be your biggest worry. Some of us normally blame it on the line quality, but it is not. Before you finish up, check to ensure there are no tangles and correct these early enough. When done, cut off the line. If you don’t plan on going fishing immediately, wrap a rubber band on the reel spool to keep it in place. I hope this step by step guideline on how to put a line on a spinning reel has been comprehensive and helpful enough. After all, fishing should not be complicated and frustrating for you once you get the loading part tight.